How does one prepare to replace something as seemingly sanitary and culturally expected as toilet paper? Well, some times you just have to dive in . . . erm . . . metaphorically speaking. Ew. If you’d like to learn more about why one would want to do such a thing, you can get the background story at this month’s Mission post. Now, you can go about getting started in one of two ways: buy them or make them. Since one of the major themes of this exercise is reduction, I opted for the DIY approach. A couple of my husbands old softened tee shirts was all it took! An old sheet, flannel PJs, dish towels or bath towels – pretty much anything can stand in here. No sewing required! I just cut the fabric into strips the width of regular TP. 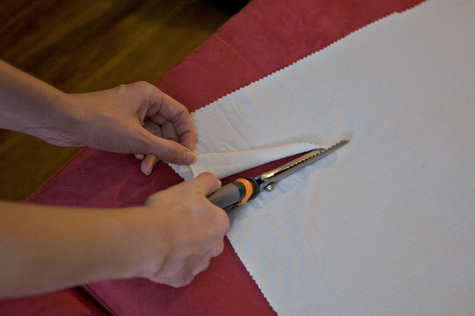 Then, cut them into lengths so that when they’re folded in half they’ll make a perfect square. From there you just need a place to store ‘em and to stash ‘em, close to the scene of the crime. I picked up this lovely secondhand basket at the thrift store, and found the perfect plain plastic waste bin for catching wipes. An empty drawer would also work great for storing the clean ones. I considered getting the biggest, tackiest vintage cookie jar i could find for used wipes. Ha! There are really a million variations here. Highly customizable. Now as far as actually *using* them, that’s a whole other story. We’ll revisit that at the end of the month. For #1 and #2? I have considered cloth for me for #1 (my husband doesn’t need to wipe I suppose). I have so many homemade wipes for cloth diapering, I thought I would just transition those to the bathroom for me when my little ones are done with them but I like the old t-shirt idea. I have a stack of those I was going to make into sacks. For now I am using TP made from recycled paper. I presume you and your hubby are both on board? I am looking forward to hearing how this goes for you guys. Once you are cloth diapering you will find it a cinch to get both baby and your cloth cleaned. First house I lived in in SB, my roomie went the cloth route for #1, and I tried it. Old socks work fine too. Never went there for #2, though. 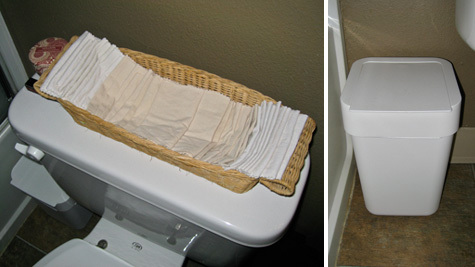 I haven’t gone the cloth route yet, but my husband and I have a few toilet waste reduction techniques. I eat more fiber, so I don’t need as much paper. We flush every other time with number one. When the garden is growing, my husband pees in a bucket mixes with five parts water and uses it for fertilizer. We also have rain barrels and an (illegal) grey water system for our washing machine. A few simple mini pillowcase-like liners with a sprinkle of baking soda and/or a drop of essential oil will keep the pail fresh and make the trip to the laundry faster. In the long run, a step trash can might be nice. @ Farmingtheburbs – Just for #1 for now, so it’s just a ‘me’ thing (no husband necessary (= ) We will be cloth diapering and cloth wiping the baby for sure! @ T – Never thought about old socks! Great idea, thanks. 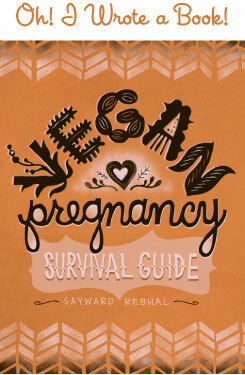 @ Lynn D. – We also do the less-frequent-flushing method, and we do eat tons of fiber, ha! I’m curious about your rain barrels and grey water system. Any info you could share? @ akeeyu – That’s a great idea. I was definitely planning to do that for the diaper bin, but I suppose I should do it for my wipe can as well. Thanks! many years ago in Morocco a savvy Dane confided in me that he used strips of silk and washed them after use and I guess pegged them to his backpack to dry ‘en route’. Old fine silk shirts or frocks etc could be used as fine silk dries super fast. Found this site looking for plans for an alternative toilet for semi remote no electricity spot on coast of NSw, Australia. Any help out there/currently bury my offerings but no good for visitors. I’m still working my way up to this one; love the concept, just haven’t put it into place yet. 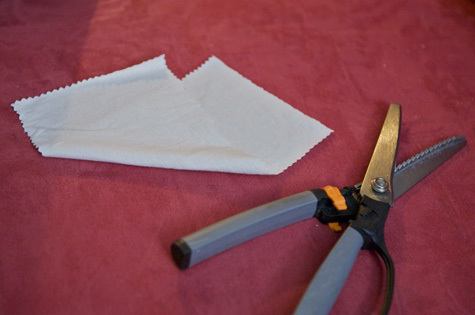 I’ve been doing cloth for my womanly sanitary needs for over a year and a half and that’s all fine….not sure why family cloth should feel so different but it does. Probably has to do with the other 5 people in my household being less than enthusiastic! We use “wee wipes” in our house for #1s and have for ages now. My 4yo daughter loves them. As do I – so much softer than paper. I use old towels cut into small squares, and overlock the edges. Marvelous! My daughter (potty trained 3 year old) and I have been using cloth wipes for about a year now. Just #1. She was cloth diapered and we used cloth wipes so it was an easy transition. I figured if I had no problem washing poopy diapers every few days. Washing slightly dampened wipes twice a week is nothing. I am using Imse Vimse’s organic cotton cloth wipes. I have a small garbage bin by the toilet for used ones and the clean ones are laid out in a pile on the counter. When my daughter uses toilet paper when we are out she hands it to me because she doesn’t know where to put it! I am lusting after the squares of flannel that I just cut from a ripped sheet, but I guess I’ll refrain from using them until I get something to put used ones in. Do you have more than one bathroom at your house? I have 3. :-P I think maybe I’ll just try to use one all of the time, and have that as my “center of operations.” Seems like a hassle to have piles of squares and a bucket in every bathroom. I also have no idea how many I need. I have no sense of how often I pee in a day. @ Meghan – We have 2 bathrooms and I keep cloth wipes in both, but I think having one “center of operation” makes perfect sense. Especially since it’s just you, you can just make sure you always pee in the right bathroom. i have been totally into greening our home since i became pregnant in nov, and i have been slowly changing things in our home from detergents to methods of living and such, but since this takes a family effort, my husband basically was like do whatever, but i want tp for my pooh… so we agreed to compromise…since we would be using very little tp, we upgraded to some that i found on Alice.com that is treeless tp, made from bamboo…is amazing. great compromise.